Coman’s first goal was unintentional, his inswinging cross just evading Thomas Mueller on its way into the bottom corner with just 14 minutes on the clock. 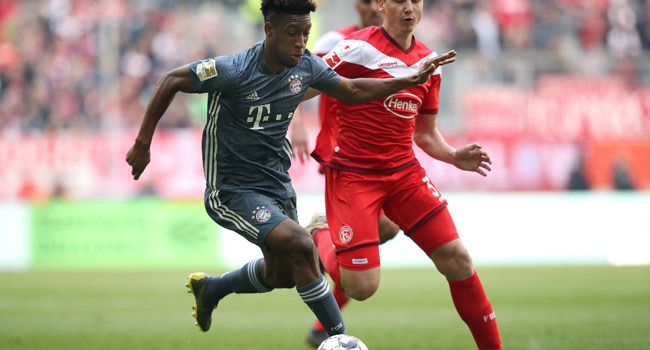 If the opener was briefly incorrectly credited to Mueller, there was no doubt about Coman’s second in the 41st minute, a well-placed finish at the end of a delightful move. Dodi Lukebakio gave Duesseldorf a late consolation goal from the penalty spot after a Mats Hummels handball, but Leon Goretzka slotted in Bayern’s fourth in injury time. “Dortmund are not playing brilliantly at the moment, but they are getting results, and that puts pressure on us,” Mueller told Sky. Only two points separate sixth-place Hoffenheim from Wolfsburg in ninth, with Werder Bremen and Bayer Leverkusen also in the running for a Europa League spot. Amiri broke the deadlock near the half-hour mark, smashing the ball in off the post with his side’s 14th shot on goal. Nelson’s 78th minute header, which was given by VAR after being initially ruled out for offside, sealed the win for Hoffenheim. “We should have been ahead by much more at half-time because we had so many chances,” Nelson told the club website.